Sathya Sai Baba’s death certificate was not legally valid. The doctor who signed it resigned from his post almost immediately, the suggestion being that he was forced into a role which he could not accept. Sathya Sai Baba’s death was announced on April 24, 2011. The certificate above was published widely in India on that same day. Not producing a death certificate is in strict violation of Andhra Pradesh State regulation, Indian law, and international law. This kind of cover-up attempt is typical of virtually every announcement made through decades by Sai Baba authorities whenever there was anything untoward involved. 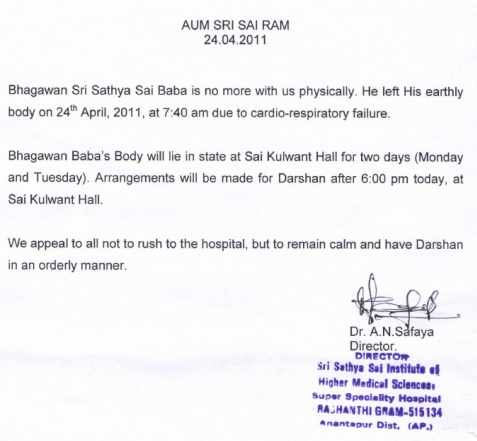 The ‘spin doctors’ of the Sathya Sai Central Trust are just continuing a tradition of secrecy… in this case keeping the public from knowing from which illnesses Sathya Sai Baba actually suffered which led to his weight loss (to 28 kilogram) and successive failure of his heart, lungs, liver, kidneys… until he was evidently disconnected from life support in a cynical ploy to make it appear he was akin to Jesus – passing away on Easter Sunday. The resurrection that was widely expected – in many instances of posted comments on newspapers and web outlets with fanatical certainty – never occurred. This entry was posted on February 18, 2012 at 10:36 pm	and is filed under Sathya Sai Baba. You can follow any responses to this entry through the RSS 2.0 feed. You can leave a response, or trackback from your own site.